ERIE, PA – For today’s public relations professionals, the challenges are significant. With the constant spread of information through both social and traditional media outlets, consumers are taking in this information at a greater pace than ever before. It’s up to communications professionals to keep up. 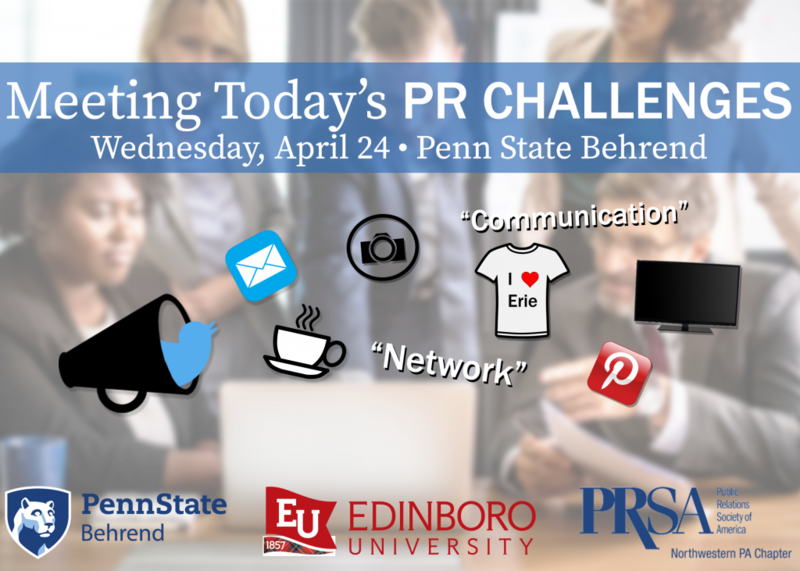 That’s a task easier said than done, but “Meeting Today’s PR Challenges,” a one-day professional development program, will provide professionals with the information and tools that can help. Scheduled for Wednesday, April 24, at Penn State Behrend, the program, which is co-sponsored by the Northwestern Pennsylvania Chapter of the Public Relations Society of America (PRSA), Edinboro University and Penn State Behrend, will feature workshops and presentations for marketing communications and public relations professionals. The program will be held in Penn State Behrend’s Reed Union Building. Sessions will be presented by professionals from Erie Food Tours, UPMC Hamot, Red Letter Hospitality, Ember+Forge, Tipsy Bean, and the Millcreek Township Office of Emergency Management. The luncheon keynote talk, titled “Perception Shift: Changing a National Conversation,” will be given by Joseph Cephas, Vice President of Communications & Brand Experience at the American Society of Interior Designers. * Full-course registration includes breakfast, lunch, and a bowl of Penn State’s Berkey Creamery Ice Cream, provided at the afternoon networking session. ** Half-course registration allows up to three sessions throughout the day. Lunch is not included with the half-course registration. Attendees who would prefer to be invoiced can request one by emailing Steve Orbanek at sco10@psu.edu. Please note that cancellations will be accepted one week prior to event. Otherwise, reservations will be expected to be paid in full. Students from any of the region’s colleges and universities — Allegheny College, Edinboro University, Gannon University, Mercyhurst University and Penn State Behrend — who are studying communications, public relations or a related field may attend free of charge but must register in advance by emailing Steve Orbanek at sco10@psu.edu. For a complete schedule and sessions descriptions, click here. To download a brochure for this year’s program, click here.